Based on reviews from 14 experts and 498 users. Learn how our rankings work or see our guide to flexible ground football boots. Updated Apr 2019. Football, the world’s most popular sport, is usually played on outdoor grass fields. That is why firm ground (FG) football boots are the top-selling variation in the market. But in the advent of artificial grass pitches, football boot manufacturers also came up with artificial grass football boots to cater to the needs of users who play on this type of playing surface. As the popularity of artificial grass pitches rises, players are faced with the challenge of getting multiple pairs of football boots, which consequently may not be economically sensible, especially for beginners. Fortunately, Adidas, Nike, Puma, and other shoe manufacturers have added flexible ground football boots to their silos. What are flexible ground football boots? As the name suggests, flexible ground football boots are versatile and can be used on different kinds of playing surfaces. 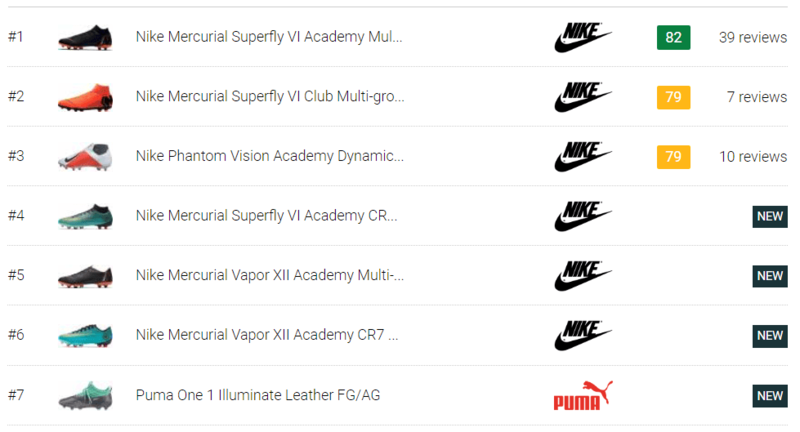 Adidas calls their flexible ground football boots FxG, Nike calls theirs as Multi-ground (MG), Puma names it as FG/AG and Under Armour has their Hard Ground (HG) football boots. Not only are flexible ground football boots engineered to provide optimum traction on natural and synthetic pitches, but they are also designed to lessen the stress on the feet while playing on different grounds. Their studs are strategically positioned so that pressure is well distributed across the soleplate. Flexible football boots, like other variations, are fitted with a variety of different elements from the upper to the soleplate in order to meet the various needs of players. Below are some of the notable features found in flexible football boots. A game-changing feature found in top-tier Puma football boots is the Netfit technology. It offers a unique lacing system that can be customized and adapts to the user’s foot width, performance, and style. The Netfit system replaces the traditional eyelet with a form-fitting net covering the upper of the shoe. It is highly recognizable with its grid-like pattern which allows the user to thread the laces through the net openings. Because of this, the shoe provides enhanced fit and support. There are five standard lacing options namely Standard, Narrow Foot, Wide, Heel Support, and Stability. The Netfit technology was launched in Speed IGNITE NETFIT in May 2017. This innovation later expanded to the Puma football boot line, including the Puma Future 18.2 Netfit Multi-ground. The Evoknit is a collar sleeve that is made of lightweight and stretchable knit. The woven material hugs the ankle for a comfortable yet supportive fit while at the same time providing good temperature regulation and breathability. Likewise, it also offers a smooth transition from the shoe to the lower leg. The geniuses from Puma worked with highly technical machinery to create an innovation like no other. The Evoknit material closest to the skin rapidly removes the sweat from the surface while the top layer of yarn pushes the moisture away. This technology is found in several flexible football boots from Puma. 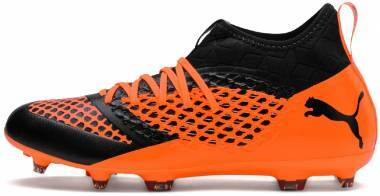 Some of which include the Puma Future 18.1 Netfit FG/AG and Puma One Illuminate 1 Synthetic FG/AG. Evoknit is also present in some Puma sneakers and running shoes as well. One of the most sought-after upper materials not just in flexible ground football boots but in other variations as well is kangaroo leather. This soft and supple material is usually found in high-end heritage football boots. It is famous not only for the comfortable fit it provides but also for its flexibility, durability, and padded ball feel. Kangaroo leather football boots stretch and adapt to the natural curves of the foot. Therefore, they offer a somewhat customized fit. Also, kangaroo leather provides more protection than its synthetic counterparts. Because of these, better ball feel is achieved when wearing a football boot with K-leather upper. An example of a flexible ground football boot with a high-quality kangaroo leather upper is the Mizuno Morelia II Made in Japan. The Ghost Lacing System is an innovative feature that was first launched in the 2018 Nike Phantom Vision series. It works in tandem with another technology, the Quadfit Mesh, to provide unparalleled fit right out of the box. This technology has six strategically positioned lace loops that require only one pull to tighten. This creates equal tension distribution across the foot and customized fit without constricting the foot. It is present in the Nike Phantom Vision Academy Dynamic Fit Multi-ground. 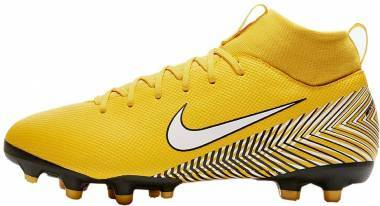 Considered as one of the coolest advancements in football boot history, the Dynamic Fit collar is featured in several Nike high top football boots. This technology was designed with an intention to create an “as one” connection between the foot and the shoe. It is made of Flyknit, another great innovation from Nike, which offers a tight fit and support without making the shoe heavy. 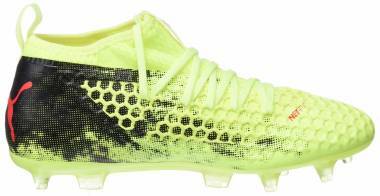 Nike’s key silos, the Magista, Superfly and Hypervenom, each has its own distinct collar cut. For the Nike Magista series, the Dynamic Fit collar has an anatomical cut, which is designed to accommodate the ankle’s round shape. With the Hypervenom football boots, the DF collar is sliced at a 45-degree angle and tailored to provide more stretch along the ridged area. The original style of the Dynamic Fit collar is found on football boots in the Superfly silo. 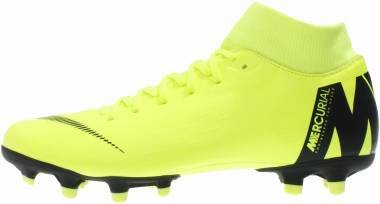 A good football boot with a flexible ground outsole and Dynamic Fit collar is the Nike Mercurial Superfly VI Club Multi-ground. The HG10mm technology is a unique structure found in several Asics football boots. It has a sole that is higher than the toe part by 10 millimeters. By raising the heel, the weight is shifted forward thereby lessening the load on the leg as well as the impact on the knee. As a result, the user can transition from standing to running faster. It is found in the popular Asics flexible ground football boot, the Lethal Speed RS. Ignite is a proprietary midsole technology from Puma. It is useful in providing responsive cushioning, superb comfort, and optimal energy return. Additionally, it also lessens the strain on the lower leg. After nine years of research and development, the innovation was first launched in a running shoe from the German brand. The Ignite midsole is made of a polyurethane material that is stable in both hot and cold weather conditions. It is more flexible and lightweight than the usual EVA insoles. Commonly seen in indoor Puma football boots, the Ignite midsole is also present in the Puma 365.18 Ignite ST, a flexible ground football boot for artificial turf, dirt pitches, indoor gyms, and concrete yards. Rapidagility is a lightweight soleplate that is made of reactive Pebax material. It comes with a combination of smartly placed bladed and conical studs. They offer excellent traction on both firm ground and artificial grass studs. 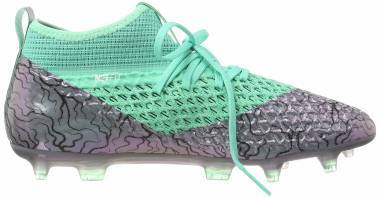 The Puma Future 2.1 Netfit FG/AG is a flexible ground football boot that has a Rapidagility soleplate. 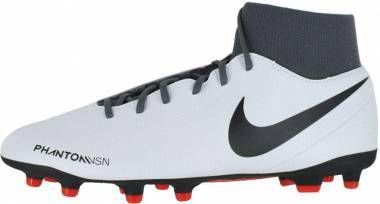 Below are some of the most sought-after football boots with flexible ground stud configuration. Famous for its one-piece upper construction and Dynamic Fit collar, the Mercurial Superfly Academy VI Multi-ground is one of the latest releases from Nike. The micro-textured surface of this football boot provides excellent ball touch even at top speed. The split-sole design of this flexible ground football boot is consistent with the elite and pro models in the Mercurial Superfly VI lineup. However, its stud configuration makes all the difference. Unlike its top-tier counterparts, the Nike Mercurial Superfly Academy VI Multi-ground has a combination of conical and chevron-shaped studs that are strategically positioned to provide maximum traction on natural and artificial grass pitches. A version of this football boot is also available in the CR7 collection. 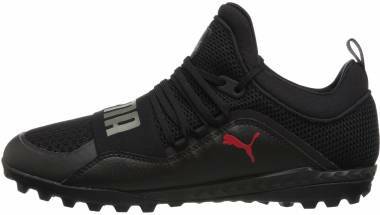 With a good combination of leather and synthetic material on the upper, the Puma One 1 Illuminate Leather FG/AG is a flexible ground football boot that provides the best of both worlds. 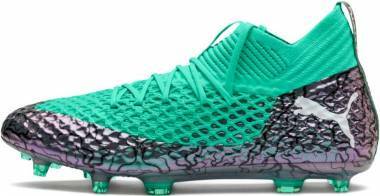 It is also considered as a high top football boot given its upgraded Evoknit sock. Another plus for comfort from this tech-heavy football boot is the addition of the Ignite midsole. The lightweight Pebax outsole of this football boot features several rounded and elongated studs that offer the finest grip on firm ground and artificial grass playing environments. 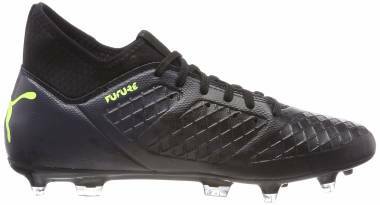 For players who are not fond of wearing leather football boots, an all-synthetic Puma One 1 Illuminate is also available in FG/AG variation as well. The Adidas Ace lineup is a flexible ground football boot engineered for control comes in the form of the Adidas Ace 17.4 FxG. The synthetic leather upper of this football boot, known as Control Feel, provides a soft natural feel on the ball. An interesting feature about this football boot is its stud configuration. The layout is biodynamically tested to provide the best possible grip on firm grounds, hard grounds, and artificial grass surfaces. There is no perfect football boot, but choosing the right pair is dependent on your needs as a player. Below is a list of pros and cons of wearing flexible ground football boots that may help in getting the pair that is perfect for you. Flexible ground football boots are cost-efficient. By providing optimum traction on a variety of playing surfaces, you do not need to buy separate football boots for specific playing grounds. Flexible ground football boots are engineered to lessen the discomfort on the player’s feet. Its stud pattern is specially configured in such a way that pressure is evenly distributed across the foot. Flexible ground football boot outsoles are specially designed to aid in accelerating and making quick cuts in different types of playing surfaces. Flexible ground football boot studs are shorter than firm ground football boot studs. As a result, they may not provide the most aggressive traction on dry, natural grass surfaces. Flexible ground football boots cannot be used on soft, muddy grounds. Because they do not have removable studs, they do not offer the best grip on wet grounds. Which playing surfaces can I use my flexible ground football boot on? Flexible ground football boots are almost always used on firm ground and artificial grass surfaces. However, there are also flexible ground football boots that are worn on indoor courts, concrete, artificial grass, and dirt pitches. 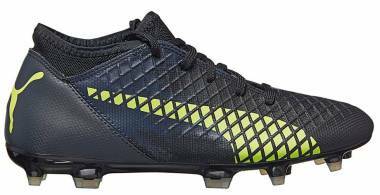 An example of this football boot is the Puma 365.18 Ignite ST.
Can I wear my flexible ground football boot on soft ground pitches? What makes soft ground football boots suitable for muddy fields are the removable studs. They allow the user to adjust the grip depending on the softness of the ground. Unfortunately, there is no available flexible ground football boot with removable studs yet.